I’ve got my first repetition in on the actual exercise of level design. 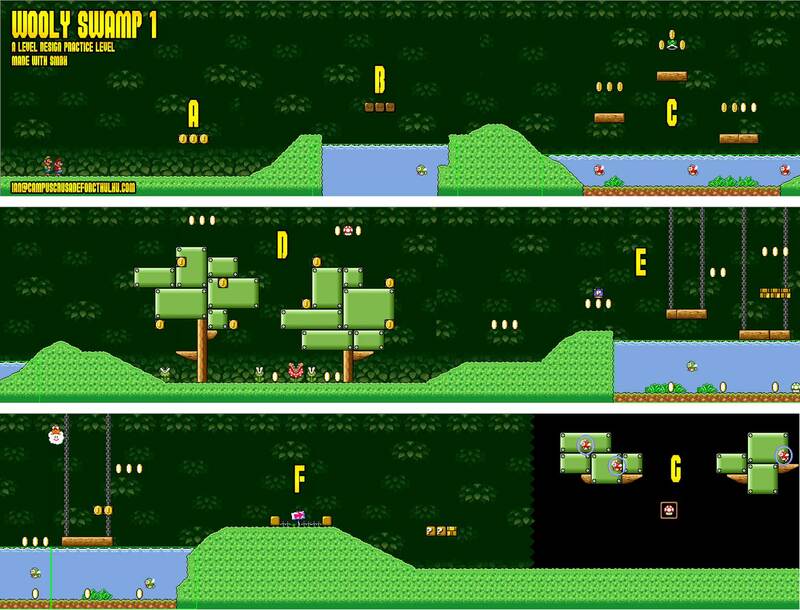 Using the Super Mario Brothers X level editor I constructed a short, but serviceable forest-y level called Wooly Swamp 1. Analysis and links after the jump. Before going into the level itself, I want to say that while I appreciate the effort that went into SMBX and I’m grateful for the free entertainment and tools, releasing a level editor in which you CAN fill empty space with blocks, CANNOT delete them en masse (that I know of), and WITHOUT an undo feature is… well, it’s a free tool that I appreciate even while throwing things at it. Okay, the level. So, as I’ve mentioned before, I’m completely new to this. I’ve noodled with Little Big Planet, but done nothing close to completing a level. I decided to step back to something simpler like SMBX because it’s based on a game that I was once good at and I feel I’ve got a reasonable lay-appreciation of the mechanics. By the by, I had no major design goals going into this level—I knew I wanted to keep it simple and short. It’s about 75% of the length of Super Mario Brothers 1-1. The image above is marked with letters so ya’s can follow along. A. I get the impression from playing SMB in general that coins are used a lot like breadcrumbs. They give the player a slight nudge in a given direction. In this case I used them to assure the player wouldn’t be confused as to which direction the level is going. B. Initially I put this pool here arbitrarily. I just knew that I wanted to include pools in the level. Retrospectively I realize that it sets up expectations for later in the level while remaining uncomplicated. Really its just window dressing that lets you know what’s in the store. The fish (cheap-cheap?) is there just to add interest. Initially I didn’t have a platform here. Players would have to swim part way. 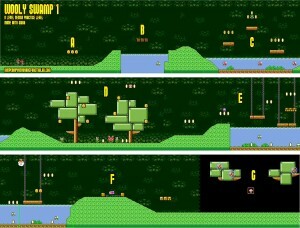 This really disrupted the flow of the level, so I added the platform later. The fact that it doesn’t match the others is an oversight—one that I would correct if this were more than an exercise. C. In keeping with the water hazard theme, I added another pool. This one is slightly more dangerous and differently styled; another aesthetic fix I could make would be to match B to C better. Here I use the coins to lay out a path again. The koopa shell comes out of a block in gameplay. One of my testers seemed to think it was awfully strange to find, and actually seemed put off. In this case my intent is to foreshadow a use for a turtle shell in the next few screens. D. The trees are a mixed bag. On the one hand, one tester expected them to be in the background, which led him to die from koopa shell trauma. This most definitely should be corrected, but I’ve left it in, at least for the analysis, because it’s a mistake that only occurred to me testers and I feel falls into the category of easy to make mistakes in general. Mario can stand in front of the green blocks (i.e. they are behind him, in the background). He can hop up on one, but not as easily down from it. What the right tree gets wrong is placing the coin blocks at foot level. When Mario is standing on that block, I find it immensely annoying that I can’t easily get to the block. Raising them up on the left, I get much better rhythm when jumping through that tree. I’m torn about moving them on the right, though, because the mushroom bounces back and forth between them in a way that can be surprising and amusing during the first play-through—a fact I discovered accidentally, while testing. Oh, and the koopa shell can be used here to clear out the plants. E. The P-switch is within a hidden block, but I give the player a sporting chance to find it just above some coins. I “hid” it because I think it’s mildly amusing to find, it amounts to kinda-sorta a hidden path in the level, and because if the player saved the koopa shell he’s already got a tool for this section. Nevertheless, it’s an almost guaranteed find. The switch represents two possible routes (maybe both, didn’t test for it). It makes platforms for an assault on Lakitu and “traps” the 1-up mushroom, making it slightly more attainable. Lakitu drops those jumping baby parana plants and he’s pretty quick about it making this section a fair challenge. I wanted him to drop red fish in the hope that they would flop about on the platforms, but that’s not how it goes down. I think this section is a bit too hard in contrast with the rest of the level. I don’t think I’ve managed to take out Lakitu yet. F. The only reason I put this here is to add visual interest. I feel like the level has peaked, but needs a bit of space to wind down, hence this spot. A few meager coins are all the reward you get form those blocks. I feel strange about rewards in a Mario game in general. I think of collecting coins and power-ups as just “what you do” in a Mario game. They don’t feel like rewards, but that’s just what they are and that’s how they function. Does anybody even look at the score? Does SMBX even keep score? G. The end. A couple of floating tree bits that, perhaps, don’t read, and some bubbled fish. I put them there to make the end of the level a little more whimsical, but it turns out that Lakitu pops them, which makes for a little fish rain, a TINY amount of risk on the end screen, and its funny—a worthwhile attribute for a Mario level in my opinion. That’s it: my first level. On the whole I found the experience to be a lot more like drawing than designing, at least for this initial outing. The process started out with a lot of searching lines and forms and ultimately I ended up hanging the set pieces of the level onto the forms and lines that seemed to work. In the future I intend to approach game design from a number of angles, but as a neophyte, the accessibility of this approach made it a good choice. My name is Ian. I want to make games. There are no local jobs and no local training prospects. It`s just me, the internet and free time. Actually, that`s not half bad. Phychology of Video Games Every article I’ve read so far offers usable insights into game design.